Our aim - To maintain simple shelters in remote country for the use and benefit of all who love wild and lonely places. I thought that I had better start by checking our credentials against NEMT's opinion of the SNH Wild Land Map. 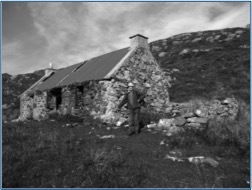 I am happy to find that in the N and NW areas where I mostly work, most of the 25 bothies that we look after in this wild and lonely place are indeed in the same blocks of "wild" land that SNH proposes. Except that as already noted by NEMT, there is a ".... comparative lack of wild land in the islands and western coastal fringe.....and in the north". Our own network also has bothies in these omitted areas - Skye, Raasay, The south end of Applecross, and in the Sutherland bogland. So at least we seem to agree on something. I'll come back to Skye later. 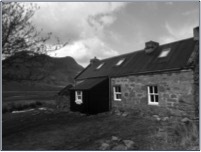 I have been a MBA volunteer for 6 years now, and have worked at 11 of the above 25 bothies, some several times, plus a few in other areas. I started when I was looking for some sort of voluntary work, preferably outdoors, but even then was sceptical about whether I would enjoy the work and the company. But I took the plunge, and had a great time digging a ditch while more experienced folk re-roofed a bothy in Wester Ross. It was interesting when one afternoon, they all sat down and had an area meeting, I hadn't realised that many of my fellow workers were members of various national committees, or else in charge of other bothies. I had an insight there and then into the workings of the organisation. I liked what I saw and heard, and realised that this type of work suited me. It got me into the hills without feeling I had to climb them, and the work part of it didn't seem like work. Gradually I got more familiar with the workings of the MBA until 3 years ago there was some discussion about the lack of an effective Maintenance Organiser at one of the MBA's flagship bothies - Shenavall, again in Wester Ross - so I thought that this was the time to put my hand up. It was a big step to take. The bothy was in a run-down condition and part was dangerous and unusable. I remember sitting just looking at the layout and the mess, thinking how on earth can I make anything of this. And then someone did a fire risk assessment which highlighted the lack of an escape route. That gave me more despair, until I had a flash of inspiration that involved taking down a wall and rebuilding it a few feet away - this would solve both problems at a stroke. finding a cook for the week (who then has the same problems of supplies). Once there, pray for good weather - nothing better for morale. If the job is going well, then give the younger ones a day off to go and climb a hill. And feed them - we provided lunches, teas and snacks. It is another great morale booster to hear the cook shout "come and get it" then all sit down together. The good thing is that all volunteers are there because they want to, but some will be experienced and some will be newcomers. And starting from day 1 on site with this mix, they have to be quickly assessed and split up into little working groups. Running my own workparty I find it best not to give myself any particular job, as there will always be someone with a query about how to do something, or is there a tool, or which timber to use, etc etc. There will always be some improvisation, and maybe leaving something to come back to later. So we have been working hard for 3 years. Volunteers have worked more than 200 person-days (put a cost on that! ) and MBA has spent around £3500 on materials. Remember that we don't own any bothies, the estates own them. By agreement we maintain them for use as bothies. Hopefully Shenavall is in a better and safer state, and can be left to tick over with a little bit of annual maintenance only. And three years older I have now left Shenavall now in the care of a younger fit keen local chap. I have moved to a bothy not too far away, much easier to get to, easier to maintain, but not in such a spectacular situation. Never mind. I mentioned Skye - I have got involved in a project for a new bothy in the south of the island, not on the wild land map. Nevertheless it is in a SSSI of about 2.5sqkm, part of a much larger glen, to my layman's eye as wild as you can get, although we know from its history that the natural history of the area has been shaped very much by man's various activities over the last several centuries. And because of the SSSI status, we have had to negotiate carefully with SNH as to what how where and when we may do things - including identifying by probe to find the ancient path to a nearby beach where we may offload and carry materials. It is an exciting prospect, and my small part is to attempt to raise HLF funding. Not something that MBA have done before, but this is why we have identified this as being a large one-off project with lots of heritage aspects. Watch this space!